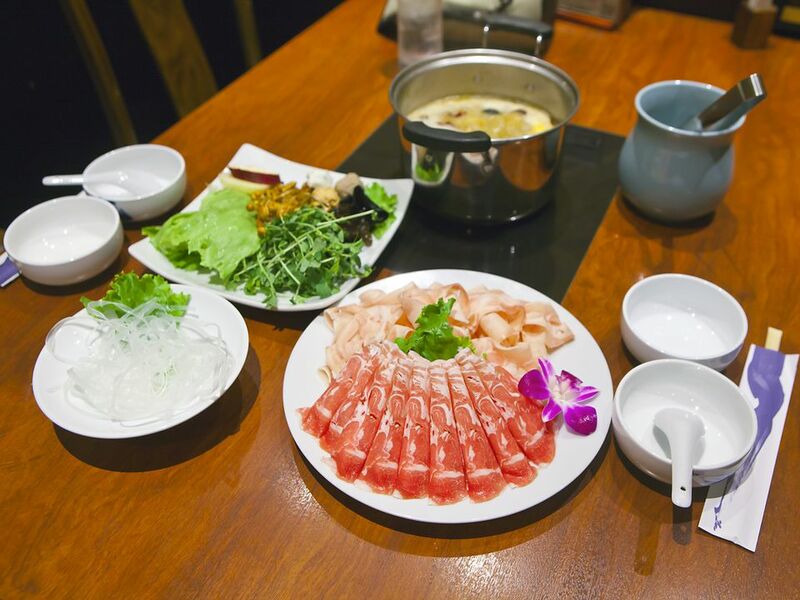 A classic northern Chinese dish, the Mongolian hot pot is traditionally made with mutton. The easiest way to prepare the broth is to purchase a leg of lamb and heat it in boiling water before slicing. However, chicken broth can be substituted. For best results, use a firm bean curd. Suggested dipping sauces include soy sauce, sesame paste, preserved (fermented) bean curd, chili oil, hoisin sauce, and red rice vinegar. Cut the lamb into paper thin rectangular slices. Slice the bean curd. Wash, drain, and chop the vegetables. Prepare any side dishes that you are planning to serve. Lay the lamb, chopped vegetables, and side dishes on separate platters on the table. Place the dipping sauces on the table in small individual bowls. Make sure each guest has a complete place setting, including a dipping fork (color-coded if possible) and a small bowl for placing the cooked food. Bring the broth with the dark soy sauce to a boil, and add the ginger and green onion. Transfer enough broth so that the fondue pot is approximately 2/3 - 3/4 full. (How much broth you need will depend on the size of the fondue pot). To serve, invite guests to spear the food with a dipping fork and cook briefly in the broth until cooked, then dip the cooked food in the sauces as desired. Use a dipping basket to cook the vegetables in batches in the hot broth and ladle out into the soup bowls. Cook the noodles and serve at the end of the meal.